Linda Vigen Phillips finds passion in creating realistic fiction told in verse, to offer hope to teens and their families who face mental or physical health challenges. Her debut novel, Crazy, depicts the struggles of a teenage girl in the1960’s coming to terms with her mother’s bipolar disorder.It earned numerous accolades, including Foreword Reviews lndieFab Book of the Year Finalist, the short-list for SCBWI Crystal Kite Award, and an Honor book for the Paterson Prize for Books. Linda’s recent book, Behind These Hands, shows how the life of a teenage piano prodigy is upended when her two younger brothers are diagnosed with Batten, a rare neurodegenerative disease. In its starred review Kirkus says, “Free verse evokes the myriad emotions brought up by the story's numerous well-balanc.ed themes. The result is a richly woven, unforgettable symphony of feelings and words.” Linda enjoys advocating for better mental health through National Alliance on Mental Illness (NAMI) and conducting writing workshops. She lives in Charlotte, NC, where she and her husband love to sit on the screened porch to watch the grass grow. Writing about life’s peaks and valleys in free verse form can be a constructive way to deal with emotional issues. You don’t have to be a professional writer to enjoy the benefits. In this workshop we will explore the expertise of contemporary authors who have mastered verse novels. We’ll dissect various writing styles to determine the key ingredients that these authors have used to penetrate readers’ hearts. Participants will have an opportunity to dig deep for a nugget of their own that can best be expressed through the power of verse. Sarah Creech is the author of Season of the Dragonflies and The Whole Way Home, which was nominated for the Sir Walter Raleigh Award for Fiction. Her short fiction and essays have appeared in various publications, including Lit Hub, The Cortland Review, Writer's Digest, and StorySouth. She's an Assistant Professor of English and Creative Writing at Queens University of Charlotte. Too often teachers admonish beginning writers with the familiar adage “show, don’t tell” like it’s a firm rule. And it’s true that writing rendered entirely in exposition fails to create the urgency and vividness of story, but it’s also true that prose writers must tell sometimes too. So when do we show and when do we tell? What’s the balance? Which moments demand the sensory experience of scene and which moments need the context that telling can provide? In this class, we will study showing and telling in scenes from classic and contemporary works of literature and discuss the choices writers make, and we will participate in writing exercises to better help us apply showing and telling in our creative work. Author and editor Margaret Bigger is offering her annual six-week course: Recalling Memories for Your Family or the Public. This opportunity is sponsored by the CWC and is designed for anyone considering writing a memoir or non-fiction book. Classes will be held on Wednesdays from 2-4 p.m. from January 23rd-February 27th. Classes will meet at Christ Episcopal Church on 1412 Providence Road. The last class is a luncheon with Margaret in her home. The cost for CWC members is $60.00 and for non-members the cost is $72.00. Textbook: $14.00 (Optional) [Pay for textbook at the class]. Joseph Bathanti is former Poet Laureate of North Carolina (2012-14) and recipient of the 2016 North Carolina Award for Literature. 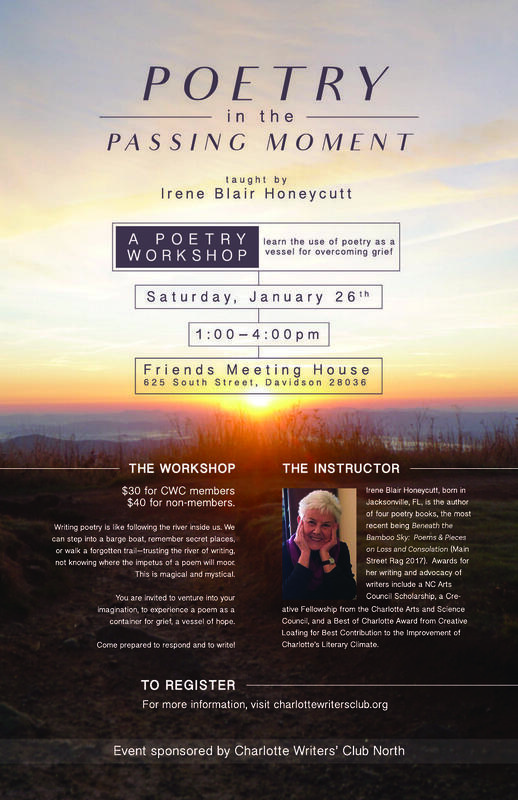 He is leading this year’s poetry workshop on Saturday, January 19, 2019 from 1:30 to 3:30 p.m. at Providence United Methodist Church, Room 104, 2810 Providence Road, Charlotte. Writing the Longer Narrative Poem, will focus on writing longer poems that tell stories through utilizing classic conventions of fiction such as dialogue, plot, conflict, characterization, setting/place, etc., while still relying heavily on key elements of poetry such as compressed, often impressionistic, language; rhythm; stylized line and stanza breaks; and attention to sound. We’ll strive to balance the image-charged voltage of poetry with traditionally discursive narrative strategies of fiction and creative nonfiction, focusing on the occasion of the poem, and the dramatic situation that inspired it. Participants will be provided with examples of narrative poems aimed at triggering the narrative impulse. 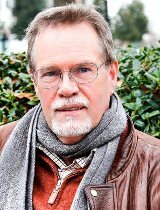 He is the author of 10 books of poetry, including Communion Partners; Anson County; The Feast of All Saints; This Metal, nominated for the National Book Award, and winner of the Oscar Arnold Young Award; Land of Amnesia; Restoring Sacred Art, winner of the 2010 Roanoke Chowan Prize, awarded annually by the North Carolina Literary and Historical Association for best book of poetry in a given year; Sonnets of the Cross; Concertina, winner of the 2014 Roanoke Chowan Prize; and The 13th Sunday after Pentecost, released by LSU Press in 2016. His novel, East Liberty, won the 2001 Carolina Novel Award. His novel, Coventry, won the 2006 Novello Literary Award. His book of stories, The High Heart, won the 2006 Spokane Prize. They Changed the State: The Legacy of North Carolina’s Visiting Artists, 1971-1995, his book of nonfiction, was published in early 2007. His recent book of personal essays, Half of What I Say Is Meaningless, winner of the Will D. Campbell Award for Creative Nonfiction, is from Mercer University Press. A new novel, The Life of the World to Come, was released from University of South Carolina Press in late 2014. Bathanti is the McFarlane Family Distinguished Professor of Interdisciplinary Education & Writer-in-Residence of Appalachian State University’s Watauga Residential College in Boone, NC. He served as the 2016 Charles George VA Medical Center Writer-in-Residence in Asheville, NC. Michel Stone is a writer, speaker, educator, and community volunteer. Her critically acclaimed novels Border Child (April 2017, Nan A. Talese/Doubleday, 2017) and The Iguana Tree (Hub City Press, 2012) have been compared to the writings of John Steinbeck and both books have been optioned for film. Border Child has been favorably reviewed by The San Francisco Chronicle, Charleston Magazine, The Charlotte Observer, The New York Journal of Books, Kirkus (starred review) among many others and was recently favorably mentioned in The New Yorker. 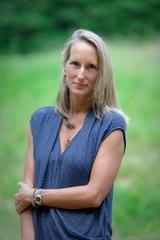 She has published numerous stories and essays and is the 2011 recipient of the South Carolina Fiction Award. 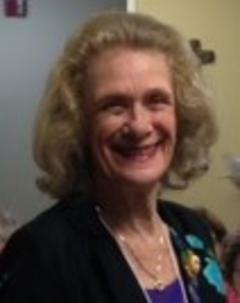 She recently received the Patricia Winn Award for Southern Literature. Stone says “works of lasting, memorable fiction tap into the human condition. In order for a writer's work to do that, the writer must be able to view the world through a variety of lenses.” Workshop attendees will participate in several writing exercises during the session. She hopes some of those prompts will spark longer pieces of writing after participants leave the class. Alice Osborn’s past educational and work experience is unusually varied, and it now feeds her work as a poet/book editor and singer/songwriter on acoustic guitar. In the past 12 years, Alice has taught writing workshops to thousands of aspiring fiction, poetry, and memoir authors of nearly all ages from 9 to 90 both around the corner and across continents. Heroes without Capes is her most recent collection of poetry and Old Derelicts is her most recent CD featuring crowd-pleasing favorite originals. Previous poetry collections are After the Steaming Stops and Unfinished Projects. A former editor for Wake Living magazine, Alice is also the editor of the anthologies Tattoos and Creatures of Habitat, both from Main Street Rag. A NC Writers’ Network, NC Poetry Society, and NC Songwriters Co-op board member and a Pushcart Prize nominee, her work has appeared in the News and Observer, The Broad River Review, The Pedestal Magazine, Soundings Review and in numerous journals and anthologies. Alice is an Irish dancer who also plays Celtic fiddle and bluegrass banjo. She lives in Raleigh, North Carolina, with her husband, two children, and four birds. Visit Alice's website at www.aliceosborn.com and check out her music at www.reverbnation.com/aliceosborn. 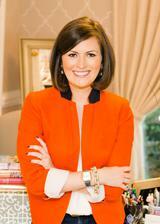 Jessica began her career being traditionally published by a big-five publisher. She then segued into the indie world with her STUDY ABROAD and FLINGS WITH KINGS series. Her most recent launch hit the top 300 in the Amazon store. She is actively building a social media platform, and hopes to cement the ins and outs of marketing her books with strategies centering around Facebook and Amazon ads, paid newsletters, newsletter swaps, and writing to market, among others. She lives in Charlotte, North Carolina with her husband, Mr. Peterson, and her smelly Godendoodle Martha Bean. Visit her website at www.jessicapeterson.com. So you’ve finished a book. Or maybe you haven’t yet, but you have an idea and you’d really like to flesh it out. Wherever you are in your writing process, you eventually want to get your book into a lot of readers’ hands. In a competitive, ever changing market, having a solid marketing plan is just as important as writing a solid book. Learn how to market your books—and your brand—this will make all the difference in the world. Cost is $30 for CWC members and $40 for non-members. Paula Martinac is the author of four published novels, including The Ada Decades, a finalist for the 2018 Ferro-Grumley Literary Award; and Out of Time, winner of a Lambda Literary Award. Her short stories and essays have appeared in Raleigh Review, Main Street Rag, Minerva Rising, Bloom, Hippocampus,and other venues. She is a lecturer in creative writing at UNC Charlotte and a writing coach/teacher at Charlotte Center for the Literary Arts. It’s no surprise that in the age of tweeting, micro or flash fiction continues to increase in popularity and visibility. Some authors are even writing complete novels and novellas in flash. In this workshop, we’ll explore how flash narratives use language to draw readers in, and how writers convey character, arc, and emotion in under 1,000 words. We’ll discuss how flash differs from prose poetry; read examples of published works; experiment with the form through several exercises; and look at publishing outlets for our micro masterpieces. Bring a notebook and your imagination! Members: When you get to the Workshop Page from the above link, please LOGIN to your membership profile to get the member discounted price. (You may need to scroll to the top of the page - The 'Log in' button is on the top right.) Then select Events to find your workshop. Saturday, June 23, 2018 1:00 p.m.—3:00 p.m. Cost: $10 for NCPS members, $15 for non-members - Write a check to 'NC Poetry Society' and bring it or payment in cash to the workshop. In this workshop, we’ll pinpoint central images and narratives of our lives and use these elements to craft poems that highlight our unique experiences and voices. We’ll explore how singular images and incidents are frequently more fertile than we thought, prompting us to explore connections and emotional reservoirs of which we were unaware. In the process, conveyance becomes seeking and the commonplace becomes epic, our verse replete with the sense of urgency that makes a poem leap from the page. Cost is $30 for CWC members and $40 for non-members. To register contact Kerry Hubbard, by clicking this link. It will open an email to Kerry. Pay the workshop fee by selecting 'Members' or 'Non-Members' below and ADD to Cart. This will take you to Paypal to complete your payment. Classes will be held on Wednesdays from 2-4 p.m. from January 24-February 28. Classes will meet at Christ Episcopal Church on 1412 Providence Road. The cost for CWC members is $60 and for non-members the cost is $72. If you have questions, call Margaret Bigger at 704-364-1788. "Storytelling, Creativity and Life" A workshop that helps you get to the core of telling stories, unlocks the creativity inside you -- and maybe, along the way, helps you become a better person. Cost is $30 for CWC members and $40 for non-members. To register contact Kerry Hubbard, by clicking this link. Pay the workshop fee by selecting 'Members' or 'Non-Members' below and ADD to Cart. This will take you to Paypal to complete your payment. 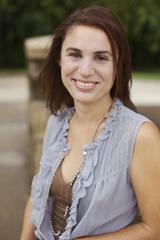 Terri Wolfe holds a BA from UNCC and an MFA in Poetry from Queens University of Charlotte. She is the co-author of Riding Out: Poems of Grief and Redemption (Mayflower 2008). 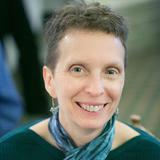 Her publications include poems in Cave Wall, Iodine Poetry Journal, Main Street Rag, Only Connect: The Charlotte Writers’ Club Anthology, and Aftershock: The Poetry of Recovery Anthology. 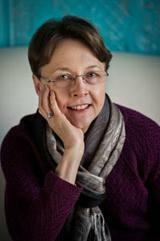 She resides in Denver, North Carolina and currently teaches small group poetry workshops. What: A workshop to engage in a deeper dialogue between the visual arts and words. Poet and teacher Terri Wolfe will introduce the process which requires a closer examination and contemplation of a piece of art to create a poem. This event is hosted by Charlotte Writers’ Club North in cooperation with Mooresville Arts. When: Saturday, October 7, 9:00 a.m.-1:00 p.m.
How: To register, contact Caroline Kane Kenna . Cost is $35 for CWC members and $45 for non-members. The fee includes a $5 donation to Mooresville Arts, a non-profit. Learn strategies for publishing flash fiction. WALK-INS Welcome!! Just bring a check with you. Cost is $30 for CWC members and $40 for non-members. To register contact Caroline Kenna, by clicking this link. Pay the workshop fee by selecting 'Members' or 'Non-Members' below and ADD to Cart. This will take you to Paypal to complete your payment. 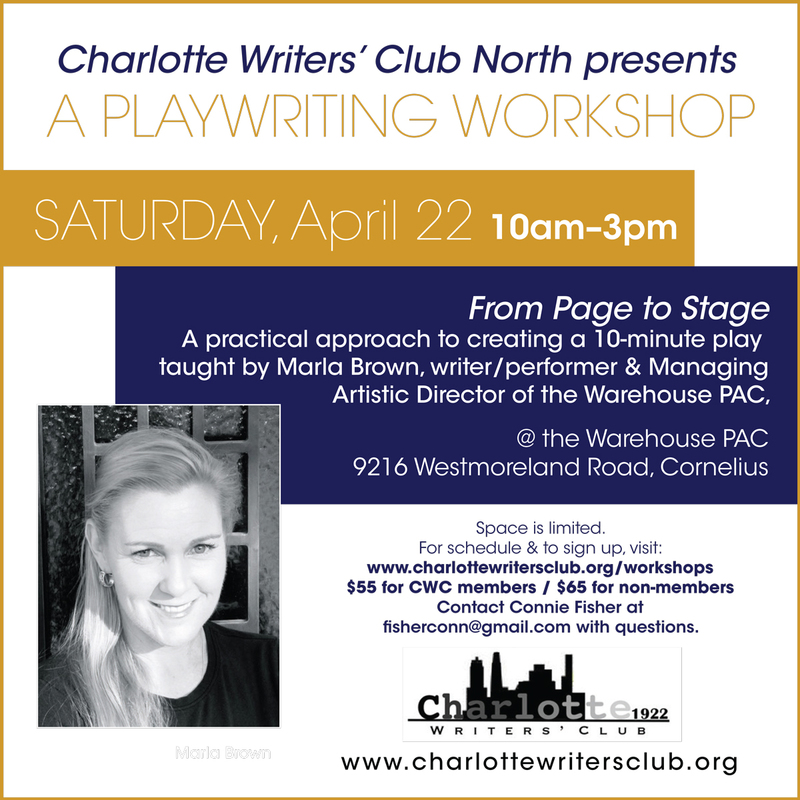 Please come to Cornelius for a playwriting workshop, on Saturday April 22, 2017, from 10 a.m. to 3 p.m. From Page to Stage is a practical approach to writing a 10-munite play, a staple of the current theater scene. The workshop is at the Warehouse Performing Arts Center, 9216 Westmoreland Road. Marla Brown, writer/performer and Managing Artistic Director of the Warehouse PAC will lead this one day workshop that including: time to read and analyze other short plays, a discussion of basic play structure and in-workshop prompts to help participants develop ideas for characters and plot and to begin writing the dialogue. Begin to write using in-class prompts, explore ideas or characters and plots;Start a dialogue to find the kernel of your 10-minute play. Reconvene to share, analyze and to discuss works in progress. Bring a sack lunch and whatever you use to compose: pen and paper, laptop or tablet. The fee for workshop is $55 for Charlotte Writers’ Club members and $65 for non-members. Preregistration is required. Please print/bring a copy of your receipt to the workshop. Email Connie Fisher to register. Click on Connie's name to open the email form. CWC North is sponsoring this event in cooperation with The Warehouse PAC. Bryn Chancellor’s debut novel, Sycamore, is forthcoming from Harper in May 2017. Her story collection When Are You Coming Home? won the 2014 Prairie Schooner Book Prize, and her short fiction has appeared in Gulf Coast, Blackbird, Colorado Review, Crazyhorse, Phoebe, and elsewhere. Other honors include the Poets & Writers Maureen Egen Writers Exchange Award in fiction and fellowships from the Arizona and Alabama arts councils. A native of California raised in Arizona, she earned her M.F.A. from Vanderbilt University and is an assistant professor at the University of North Carolina at Charlotte. This fiction workshop will focus on the technique of setting, exploring ways to establish place, time, history, and the rules that govern a story’s fictional world, as well as how setting intersects with and informs other craft elements. We will discuss a few short examples but primarily focus on writing through targeted exercises, which can be used to generate new material or develop works in progress. David Radavich will present a workshop called “Polishing Your Poems” on Saturday, February 4, from 10 a.m. to noon at Providence United Methodist Church. The focus will be on revising and polishing your poetry for contests and publication. Participants will discuss theory and examine “before” and “after” poems. Bring a poem to revise. Cost: $30 for Charlotte Writers’ Club members, $40 for non-members. To register contact workshop@charlottewritersclub.org. Pay the workshop fee by selecting 'Members' or 'Non-Members' below and ADD to Cart. This will take you to Paypal to complete your payment. Classes will be held on Wednesdays from 2-4 p.m. from January 18-February 22. Classes will meet at Christ Episcopal Church on 1412 Providence Road. Charlotte Writers Club North is hosting the event from 1:30-3:30 p.m. for writers interested in using scenes from their lives in telling their stories. The workshop fee is $35, Charlotte Writers' Club members pay $25. Bring a journal and fast writing pen. You may (but it's not required) bring a battery-powered laptop. Workshop limited to 20 people. A reception will immediately follow with Reading and Signing from 4:30 to 5:30. (Reception & Reading are free and open to the public). You can pay for the workshop by either sending your check to the below address, or you can pay using Paypal by selecting the amount and clicking on the Add to Cart button. If paying by check, please include the workshop name on your check. Classes will be held on Wednesdays from 2-4 p.m. from January 21-February 25. Classes will meet at Christ Episcopal Church on 1412 Providence Road. The cost for Vietnam Veterans who are CWC members is $30 and for Vietnam Veterans who are non-members is $36. To register, call Margaret Bigger at 704-364-1788 . The class is limited to 20 participants so sign up soon! CWC is co-sponsoring this event as a precursor to the NCWN fall conference being held in Charlotte. CWC members Gilda Syverson, Patrick Lee and David Radavich will be leading a free writing workshop on Friday, November 21, 12-1:30 p.m. at Queens University that will be open to the public. Queens University will offer free parking in a nearby deck and will have signage pointing to the location on campus. Saturday, October 18, 10 a.m.-12:30 p.m. Poet and creative writing instructor Alice Osborn will offer “Market Yourself Like a Rock Star Author” on October 18, 10 a.m.-12:30 p.m., at Providence United Methodist Church. This Charlotte Writers’ Club-sponsored workshop is for both published and yet-to-be published writers who need help crafting a marketing strategy for getting the word out about their books via social media networking, websites, blogs, and the good old-fashioned way with press releases and media contacts. If no one knows who you are, how will they buy your book? Osborn will give tips and tricks from her own experience as a successful published writer/editor and will address publicity/marketing tips for both traditionally and self-published authors. Cost: $25 for Charlotte Writers’ Club members, $35 for non-members. To register email workshop@charlottewritersclub.org or click the Add to Cart button below and indicate whether you are a member or non-member. David Radavich will present a workshop exploring "The Self in the Poem" on Saturday, May 31, from 10 a.m. to noon at Providence United Methodist Church. A version of the poet’s "self" functions as the speaker in every poem, but what is the nature of that self? In relation to what other persons or objects in the poem? How different is a persona poem? What masks might the poet put on or take off? In a dramatic monologue, what selves are being expressed? These and other questions of lyric identity and relationship will be examined through a variety of poems in discussion. Cost: $25 for Charlotte Writers’ Club members, $35 for non-members. To register contact workshop@charlottewritersclub.org. Pay the workshop fee by clicking on the Donate button to your left and indicating you will attend the workshop as a member or non-member. Christ Episcopal Church, Charlotte, N.C.
For anyone ready to write memoirs or considering doing a nonfiction book or short stories, the Charlotte Writers' Club is sponsoring its annual six-week course: "Recalling Memories for Your Family or the Public," taught by Margaret Bigger, author/editor of 24 books. Classes will be held 2-4 p.m. on Wednesdays January 22-February 26 at Christ Episcopal Church, 1412 Providence Road. Cost for CWC members is $60; non-members pay $72. Register by calling Margaret Bigger at 704-364-1788. The class is limited to 20 participants so sign up soon! Every free verse poem deserves to find its best, unique form. But how to decide about line lengths, stanza breaks, and other structural elements? David Radavich will lead a workshop on Saturday, June 22, from 10 a.m. to 12 p.m. at Providence United Methodist Church, Providence Road at Sharity Amity Road, called "Shaping the Poem." The workshop will focus on: 1) the tempo of the poem; 2) the breath of the poem; 3) the shape of the poem; and 4) the harmony of the poem. Participants will examine poems by past masters and do a couple exercises to explore the possibilities available to the contemporary poet. Poetry Workshop* from 1 p.m.-4 p.m.
Space is limited to 20 participants; registration required. Reading & Reception begins at 7 p.m.
Open to the public with reception to follow. CWC-North is honored to sponsor an afternoon workshop led by the current North Carolina Poet Laureate, Joseph Bathanti, who will read several selections in the evening. Please come out and join us for this special event! Bathanti’s books of poetry include Concertina (forthcoming book of prison-related poems will be released from Mercer University Press, Fall 2013), Sonnets of the Cross (Jacar Press, 2013), This Metal (St. Andrews College Press, 1996 and Press 53, 2012), Restoring Sacred Art (Star Cloud Press, 2010), Land of Amnesia (Press 53, 2009), Anson County (Williams & Simpson, 1989 and Parkway Publishers, 2005), The Feast of All Saints (Nightshade press, 1994), and Communion Partners (Briarpatch Press, 1986). He has published two novels, Coventry (Novello Festival Press, 2006) and East Liberty (Banks Channel Books, 2001), along with a book of short stories, The High Heart (Eastern Washington University Press, 2007). *Workshop registration opens on July 1. Space will be limited to 20, but individuals who are interested may be placed on a waiting list. The smaller workshop will give attendees the opportunity to take part in a more creative, hands-on environment. Please check back on July 1 for details on registering. If you're ready to write your memoirs, or if you want to write a nonfiction book or short stories, sign up for "Recalling Memories for Your Family or the Public," an annual fundraiser for the Charlotte Writers’ Club taught by Margaret Bigger, author of Recalling Your Memories on Paper, Tape or Videotape. Registration fee for the course is $60 for CWC members, $72 for non-members. Register by calling Margaret Bigger at (704) 364-1788. Alice Osborn will lead a workshop, Publicity and Marketing for Writers, on Saturday, Oct. 20, from 10 a.m.-12 p.m. at Providence United Methodist Church at Providence and Sharon Amity Roads in South Charlotte. This workshop is for writers who wish to craft a marketing strategy for their books via social media networking, websites, blogs, and good old-fashioned press releases and media contacts. Registration costs $25 for CWC members and $35 for non-members. For further information, contact avosborn@earthlink.net. 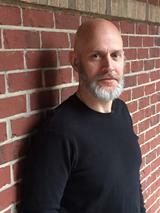 Osborn is the author of three books of poetry, After the Steaming Stops (Main Street Rag, 2012), Unfinished Projects (Main Street Rag, 2010), and Right Lane Ends (Catawba, 2006), and editor of the forthcoming anthology Tattoos (Main Street Rag, 2012). Her work has appeared in the News and Observer, The Broad River Review, The Pedestal Magazine, Soundings Review, and numerous journals and anthologies. She lives in Raleigh with her husband and two children. Visit her website at www.aliceosborn.com. "A Riddle Wrapped in a Mystery Inside an Enigma"
Sunday, October 21, 2012, from 2 p.m. to 4 p.m.
Saturday, August 4, from 11 a.m. to 1 p.m.
You've finally written a book ... now what? Learn the basics of properly formatting your manuscript for the Amazon Kindle and Barnes & Noble Nook, setting up your online accounts, and selling your e-book. 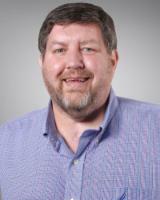 Kris Wampler will lead a workshop on e-publishing on Saturday, August 4, from 11 a.m. to 1 p.m. at the Morrison Regional Library, located at the corner of Morrison Boulevard and Colony Road in the SouthPark area of Charlotte. Registration costs $25 for Charlotte Writers' Club members and $35 for non-members. To register or obtain further information, email Kris by clicking here. 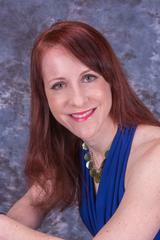 Kris Wampler is an attorney and co-vice president of programming for the Charlotte Writers' Club. He's the author of Love Train, a parody novella, and "The Obituary," a short story, both available on Amazon.com and BarnesandNoble.com. Your stories of “way back when,” your knowledge of family history and your perspective on life will be lost forever, unless you record them now. This course will help you preserve them for your family or even the public. Although you may not consider yourself a writer, you will surely enjoy the process of recollection. About the Instructor: Margaret is the author of Recalling your Memories on Paper, Tape or Videotape, editor of Gray-Haired Grins & Giggles, World War II: It Changed Us Forever, The Great Depression: How We Coped, Worked and Played, and World War II: Hometown and Home Front Heroes. Since 1989, Bigger has taught this course for CPCC, Queens University, Shepherd’s Center, at retirement centers in three states and as an annual fundraiser for the Charlotte Writers’ Club. To enroll, call Margaret at 704-364-1788. Liven up your dog-day summer with a workshop sponsored by the Charlotte Writers’ Club called “Self-Publishing and Promoting Your Writing” led by Jessie Carty and John Hartness on Saturday, August 6. The workshop will explore the nuts and bolts of publishing and e-publishing your writing, along with tips on how best to market and promote your work via electronic and social networking media. The workshop will run from 9 a.m. to 1 p.m. at Providence United Methodist Church, located at the corner of Providence and Sharon Amity Roads in Charlotte. Fees are $30 for Club members and $45 for non-members. Or register online at PayPal by clicking the button below. Want to make your writing sing? Wish your work would catch an editor’s eye? If you’ve ever wondered what you don’t know about improving the quality of your writing, or would like to contribute to other writers by providing a critique, this half-day workshop is for you. Explore ways to revise your own writing and to get and give feedback that provides maximum value. Attendees will break into smaller groups so bring copies of your own work for critiquing. This workshop will offer something for every writer at every stage: members of a long-standing critique group can learn new techniques and approaches; a new club member looking to start their own critique group will learn what critiquing needs to accomplish to be successful; and community members who have written for the first or one-hundredth time can get supportive and encouraging feedback from other writers on their work. Similar to the workshop taught by Maureen at this year's North Carolina Writers’ Network fall conference, this special half-day workshop will be more in-depth and intense to give all attendees the opportunity to practice new techniques and participate in revision/critique exercises in smaller groups. Light refreshments will be provided. When: Saturday, April 2nd, from 12:30 p.m. to 4 p.m.
Maureen Ryan Griffin, an award-winning poetry and nonfiction writer, is the author of Spinning Words into Gold: A Hands-On Guide to the Craft of Writing, a grief workbook titled I Will Never Forget You, and two collections of poetry, This Scatter of Blossoms and When the Leaves Are in the Water. She offers individual coaching and critique, as well as an expansive selection of retreats, workshops, and classes, through her business, WordPlay. Learn more at her website, www.maureenryangriffin.com. Spinning Words into Gold is a comprehensive manual with tools and resources to nurture, inspire, and empower the writer in all of us. The book includes essays, examples, and exercises throughout organized into the Whos, Whys, Whens, Wheres and Whats of Writing as well as five chapters on the How. With information on beginning, shaping, polishing, marketing, and sustaining your writing, Spinning Words into Gold is an excellent resource that writers will be using long after the workshop is over. *This workshop series has already started so we are no longer taking registrations for this workshop. 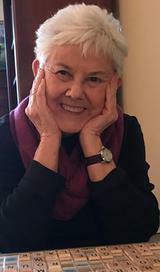 About the Instructor: Margaret is the author of Recalling your Memories on Paper and Tape or Videotape, editor of Gray-Haired Grins & Giggles, World War II: It Changed Us Forever, The Great Depression: How We Coped, Worked and Played, and World War II: Hometown and Home Front Heroes. Since 1989, Bigger has taught this course for CPCC, Queens University, Shepherd’s Center, at retirement centers in three states and as an annual fundraiser for the Charlotte Writers’ Club.